Locavores, get ready to buy fresh, local fruits and veggies! 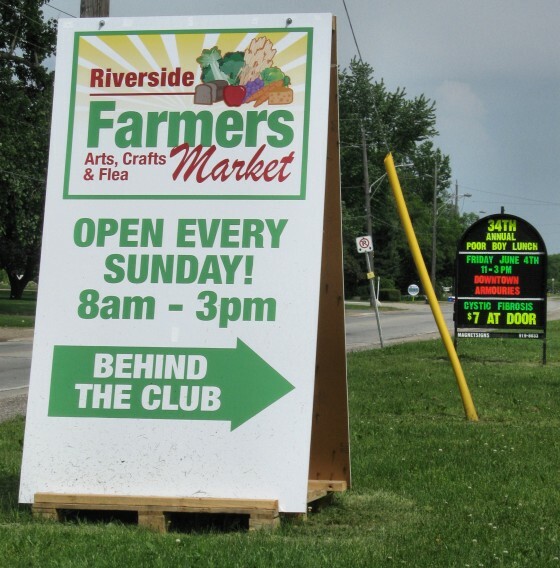 The Riverside Farmers’ Market continues this Sunday at the Riverside Sportsmen Club, 10835 Riverside Drive East. Tomorrow also marks the grand opening of the Amherstburg Farmers’ Market (7860 County Road 20 & Howard (CR9) Amherstburg). The Lakeshore Farmers’ Market can be found at 2742 County Road 42 St. Joachim. And last but not least, the Downtown Windsor Farmers’ Market kicks off the season next Saturday at 8am (44 University Avenue East – in the former bus terminal parking lot). Farmers’ Markets are a great place to pick up farm-fresh produce, baked goods, flowers and plants, and to browse local artwork and hand made crafts!